It was a case of serendipity, being in the right place at the right time. 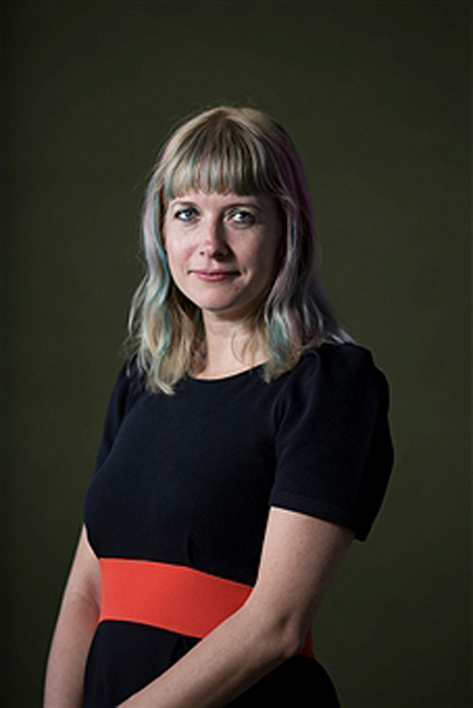 Noticing a passing tweet from the Edinburgh Book Festival saying that author Lauren Beukes had an event on at the festival at the weekend, I thought I'd try my luck and cheekily tweet her back to ask for an interview. Here is the result. Hi Lauren. Thanks very much for agreeing to talk to us at such short notice. Firstly congratulations on the fantastic new book and I guess the first thing I should ask is how your event went last night? It went really well! It turned into a far ranging discussion on South African literature and history and how Mandela was an incredible man, but ultimately just a man, not a golden god and that makes him all the more remarkable. It’s something I picked up on Broken Monsters. There aren’t gods, there aren’t monsters – there’s only us and everything we’re capable of. It was lovely to appear with Carol-Ann Davids as her book [her debut novel The Blacks of Cape Town], is very much a personal novel about family history and identity and race and guilt, very straight in contrast to my own weird stuff! It’s not your first time at the festival, how did this year differ from last? I did another conversational talk last year with the acclaimed Russian author Mikhail Shishkin, talking about time travel. Last year I also met my comics artist here for the first time Inaki Miranda. I have worked with him for years via email on our twisted Rapunzel comic, Fairest, the Hidden Kingdom. but this was the first chance we had to actually meet face to face, so that was really special. I love collaborating with an artist who understands my work. I worked in animation for five years in South Africa and that’s partly why my writing is visual – because you have to be able to describe it precisely because someone has to draw it. In one issue, I forgot to specify that the invading goblin hordes were wearing western medieval armour and he drew them in samurai armour. He had to re-do three pages, because I wasn’t specific enough. He didn't speak to me for quite a while after that. But there's also times that the artist sees something in your work that you didn't and it sparks something new. The first two books - Moxyland and Zoo City were Sci-Fi and set in your native South Africa. The next two, The Shining Girls and Broken Monsters are more crime/thriller in style (although with a dark Sci-Fi/supernatural twist) and set in the USA. What prompted the change in both setting and style? I knew the kind of story I wanted to write, about a time travelling serial killer, but I didn't want it to be Bill and Ted's Excellent Killing Spree. I wanted it to be a look at the 20th Century and how much that’s shaped us and, really, that period in South African history was all about apartheid and that would have really overshadowed the rest of the story. When you think about the 20th Century the major social and historical upheavals centred around the USA - the Depression, McCarthy-ism, Terrorism. I knew the book had to be set there and I’d lived in Chicago so that seemed the obvious choice. The Shining Girls is set in Chicago, but to be honest it's really a reflection of Johannesburg - maybe Johannesburg, Illinois! Likewise with the settings in Detroit , they are a reflection of a Johannesburg suburb called Hillbrow – where Zoo City was set and, like Detroit, Hillbrow has a bad rep for representing everything that has gone wrong with a whole country. This is the pustulent boil of capitalism, but I wanted to pop that boil. Yes, there's poverty there, crime, broken buildings, boarded-up windows; Detroit is evocative because it feels like the ruins of our civilisation. But it's also home to some 700 000 people and most of them are just trying to build a life. There are people who are the bright against the blight and that's what I wanted to capture. Style-wise all my books are different! I spoke to Val McDermid the other day while I was here [at the Book Festival] and she told me she enjoyed my book but that the ending was "a bit weird" for her. I re-read Jeff Noon's Vurt recently and it surprised me how much of the DNA of his work has leached into my own writing. He is a big influence. And there's William Gibson, 2000 AD, Alan Moore... it was hard to get science fiction books in South Africa in the 1980's - the sci fi shelf in the shops was literally 8 books wide. A lot of my reading had to come by mail order, from a guy that used to take a suitcase over to the US and fill it with books then come back and compile a small catalogue that he photocopied and sent out that we could order from. It was all a bit "under the counter", almost artisanal book selling. I even had to send off for my Nine Inch Nails albums because of sanctions and limited markets. Did you feel any pressure to deliver with Broken Monsters after the enormous success of The Shining Girls? Absolutely - there was huge pressure. I have been touring for basically the last year and a half. I was out of the country 16 weeks last year. And it’ll be 10 this year and because South Africa is so far away, they are loooong flights. I wrote Broken Monsters inbetween all the touring and I think I ended up too close to the book, too involved with it to see if it was any good. Unlike with The Shining Girls where I knew it was good, with Broken Monsters, I just wanted someone to take it off my hands and tell me if it was okay. But now that I’ve had a little perspective, I’m very proud of it. It’s my best and most challenging book to date. The pressure is going to be trying to ensure that the next one ups the ante. With Broken Monsters did you find it difficult to get into a dark headspace? Surprisingly not, a lot of it was just there. A friend of mine said to me "you realise you've written about an artist possessed by a dark creative impulse, right?" It was more difficult for me to come out of the headspace at the end of it all. Like surfacing. Do you find it harder giving all the multiple characters space to evolve as opposed to a single protagonist? No they evolved on their own and grew into their own characters. Layla was definitely the easiest to write and TK is great. Gabi had to actually do stuff like solve the crime, which drove her narrative, but she’s also worried about her daughter and how she’s having to compromise on all fronts. They are all troublesome in one way or another though. And none of them is all me. As with all characters you take a seed of yourself and let it grow into a tree. The caustic humour is probably mine though. I've been told to ask about Zoo City by one of our team who is a huge fan, I understand there is a film in planning that you’ve adapted the screenplay for. How is that going and when is the film slated for release? It's definitely going! I have a meeting with the producers when I get back and, as a project it is crawling along steadily. Really though, we need someone to come up with £30m to make it because someone [she smiled] put a magical animal in every scene and that has to be done properly. This can't be a low budget indie movie, we really need Andy Serkis to be Sloth! Well I'm touring for the next while and I'm also pitching four new book ideas! All I can tell you is two are South Africa based and another two are in the US. There is also a wonderful hard comic collaboration with Joey Hi-Fi - I can't tell you any more other than it is brilliant and I'm so excited by it. We've also got a Broken Monsters event coming up in Detroit that I'm really excited about. tied in to announcement of the first Write-a-House grant. (Writers, who all have to be based in the US, can apply for this residency to live in a newly done up house, that has had £30,000 spent on it and, if they come up with a completed book in the time that they are there they get to keep it. Yes, they get to keep the house itself. How amazing is that?) So we're announcing the winner of that residency at the same time as the Broken Monsters event. And South African curator Jacki Lang and I are talking about doing another charity art show like we did for The Shining Girls last year. We had a bunch of artists, both famous and new talents, creating artworks on pages from the book that were sold off for charity. None of the artwork had any names on and each one had to sell for R1000. Everyone did something different with their page, someone just underlined the words, but other artists played with laser cut, painted over it, illustrated insane scenes, made up fake advertisements, turned the page into a light box or a work of jewelry. One of the works I remember, one artist actually set fire to his page and sent back the ashes, which I thought was quite a neat commentary, given that I had dissed his artwork earlier on that year. Anyway, we gave buyers the ability to only buy one artwork at the event and there was a queue down 4 flights of stairs an hour before the show even opened. We raised nearly R100,000 that night. It's great to be able to showcase other talent like that too. When you find yourself in the spotlight there's enough light to share around. Final question, and one I often ask authors, is what are you reading just now? I've just finished a book called Afterworlds by Scott Westerfeld, and really I hate him for it because I wish I'd written it! I've also just gone back to the classic From Hell by Alan Moore who, in my eyes, can do no wrong. I mean Watchmen, V for Vendetta and From Hell, that's the holy trinity of books.